With apologies to Cole Sear of "The Sixth Sense," high-yield bonds are showing some very troublesome signs, as are corporate credit spreads. 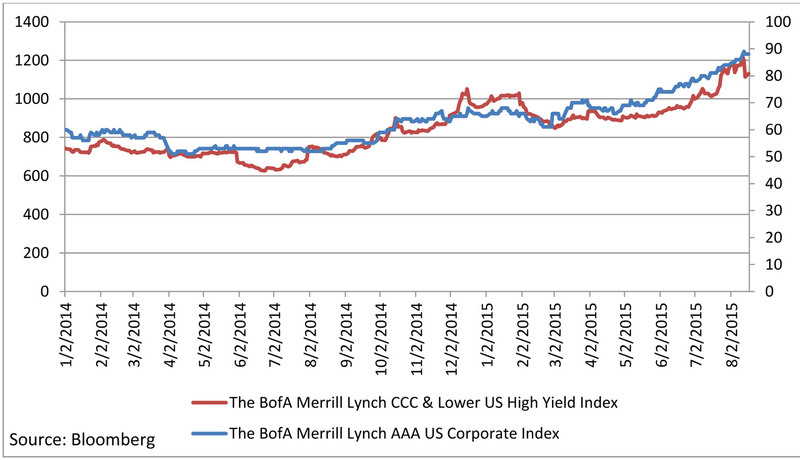 U.S. corporate credit, particularly high yield, is showing some very troublesome signs. One could say that it looks to be on the verge of a breakdown. Junk spreads (the red series that is plotted on the y-axis in the chart belwo) have risen to over 11% from less than 8% at the beginning of 2014. However, U.S. equities are not showing the same kind of stress in the VIX (this article was written on Wednesday of last week and it has since started to show significant stress). Since these are claims on the same financial assets, something has to give. Either corporate spreads have to tighten (or at least stop widening) or equities have to fall. By a lot. Corporate credit has always had a special role in the financial markets, particularly when it comes to early warning of equity problems. However, in today’s financial system it is more critical than ever. Junk spread is essentially the amount of money investors want to pay in order to take the risk of investing in “CCC” or lower entities. It has always been a great measure of the degree to which investors want to take risk. And it is showing some worrisome signs, as the chart above indicates. Before considering what the corporate credit turmoil means, let’s take a detour around the world to China. Most market observers were shocked by a recent series of ‘Black Swans’ coming out of China. First, a tremendous market crash that was temporarily stopped by the government literally threatening to arrest short sellers. That didn’t work out and equity markets in China are in a tailspin again. Then a yuan devaluation that sent shockwaves through the financial system by disrupting a yuan carry trade. That carry trade essentially had traders borrowing in currencies that have low interest rates (U.S., Japan) and then buying yuan in order to buy yuan-denominated assets to reap a higher yield offered by those assets. Clearly, devaluation of the yuan causes losses for such a strategy and those trades are being unwound in a hurry. All financial crises have similar mechanisms in play. During good times financial players accumulate too much leverage. Then some trigger event hits and those players are exposed. Many people focus on the trigger event and since there can be an infinite number of triggers, they will ascribe a crisis to a Black Swan, a completely unpredictable event. But the essence of the matter is to look past the trigger and focus on a leverage accumulation mechanism. In a previous article I explained that the key transmission of leverage to the Chinese stock market occurred through the shadow margin debt estimated at over four trillion yuan that was extended to millions of day traders that decided to play in a Chinese stock market casino. Every crisis has a unique conduit that helps to build up leverage. Leading up to 2008, the transmission of leverage to the financial system was done by banks creating off-balance-sheet entities in addition to increasing their legally visible debt. Those entities invested in real estate securities including subprime and the whole system unraveled when those levered bets went south. So, how is all this connected to the corporate spreads-widening with which we began this post? The connection is that corporate credit is the main driver of the stock market bubble today, just like margin shadow debt is for China. The Fed’s zero interest rate needs some way to get into the stock market. In the U.S. there is no shadow margin debt system like there is in China. Also, there appears to be no major off-balance-sheet vehicles investing in U.S. assets as there were in 2008. Corporate credit has been functioning as one of the main conduits of the Fed’s free money to the stock market. Corporations borrow money at historically low interest rates, and then buy back their own shares, artificially driving EPS growth (and executive bonuses). According to data from Birinyi Associates, stock buybacks in 2015 are set to reach $1.2 trillion, shattering the previous record of $863 billion. When was the previous record established? You guessed it, in 2007. It’s important to recognize that most of the companies that are borrowing to buy back their stock are not junk rated. These are investment-grade companies. But take a look at the chart that we started with. Corporate AAA spreads have also been climbing. In fact they have gone from 0.6% to 0.88%. The spread is still under 1%, but the trend is troublesome. Before 2008, the corporate AAA spread crossed the 1% line in the fall of 2007 and never looked back, eventually reaching 6% at its peak. If those spreads cross 1% and keep going, in our opinion that would indicate a very strong early warning signal for a systemic event in the financial markets. To watch the Corporate AAA spread you can use this page from the St. Louis Fed.